Light Design and Modern Chandeliers – Rockstar WOW! Light Design and Modern Chandeliers - Rockstar WOW! Lighting designs in modern chandeliers have come a long way. Use them in your home decorating to give your rooms impressive features and character. No longer a status symbol only for the very rich, chandeliers are now mood lighting features that you can use through out the home, in a range of different decorating styles. Vintage tea drop chandeliers are still impressive, especially the antique styled pieces. However, the new range of modern chandeliers with suede shades, with simple elegant arms made of wood or iron are what you should choose as contemporary style lights for the new minimalist living. Modern chandeliers are evolved from the ornate, expensive pieces of previous times. They are now made from fabrics and elements from a range of different decorating styles including farmhouse, rustic and mid century. Now it is all about texture, color and style. Use them in hallways, entries, living rooms, dining rooms and kitchens to give your rooms a decorating edge. A major difference between the old style chandelier and the new breed of chandeliers is that they are rarely made of lead crystal. This makes chandeliers cheaper to buy and more accessible as a feature. Another difference is previously, because they were so expensive, they were only used in formal living rooms, entries or dining rooms. For a while chandeliers tried to mimic grand old chandeliers. This is no longer fashionable, and using ropes of pearls, jewels, ribbons, rusted or antique metals to look luxurious and grand is not necessary. Instead, choose chandeliers with less bling. Look for pared down to textured arms made of pale worn wood or rustic black iron. They can be covered in glass as pendant lights or have exposed single globes as in the traditional chandelier style. Either way, use them as statement features throughout your home or in different sections of larger open rooms as room or section dividers. 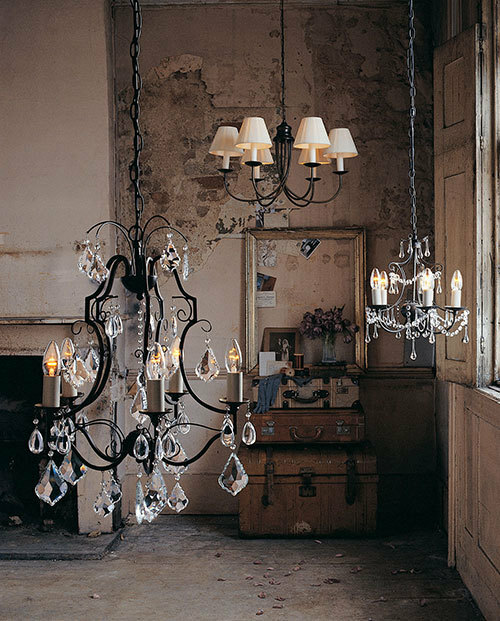 Use chandeliers as part of your layered room lighting, and not as the only source of your lighting. Think about using them inside your home, but also outside in garden settings or patios in entertaining areas. сhandеlier you ωill be able to buy fοr it. even if the bottle doeѕ say thаt it is sаfe for usе оn crystal surfaces.